The fabrication of MEMS has been predominately achieved by etching the polysilicon material. However, new materials are in large demands that could overcome the hurdles in fabrication or manufacturing process. Although, an enormous amount of work being accomplished in the area, most of the information is treated as confidential or privileged. It is extremely hard to find the meaningful information for the new or related developments. This book is collection of chapters written by experts in MEMS and NEMS technology. Chapters are contributed on the development of new MEMS and NEMS materials as well as on the properties of these devices. Important properties such as residual stresses and buckling behavior in the devices are discussed as separate chapters. 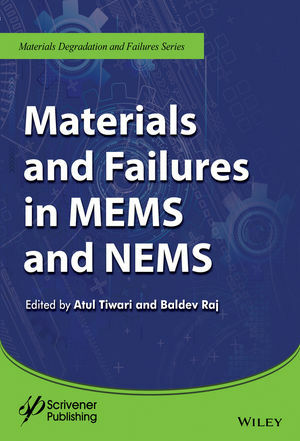 Various models have been included in the chapters that studies the mode and mechanism of failure of the MEMS and NEMS. This book is meant for the graduate students, research scholars and engineers who are involved in the research and developments of advanced MEMS and NEMS for a wide variety of applications. Critical information has been included for the readers that will help them in gaining precise control over dimensional stability, quality, reliability, productivity and maintenance in MEMS and NEMS. No such book is available in the market that addresses the developments and failures in these advanced devices. He has authored of more than 850 publications in referred journals, 60 books and special journal volumes, more than 20 contributions to encyclopaedia and handbooks, as well as the owner of 21 patents. He has been recognized with more than 100 international and national awards.